Welcome to our Ultimate Guide to building your own calisthenics home workout gym! Why should you build a home calisthenics gym in the first place? What factors do you need to consider when choosing what equipment to buy for your gym? 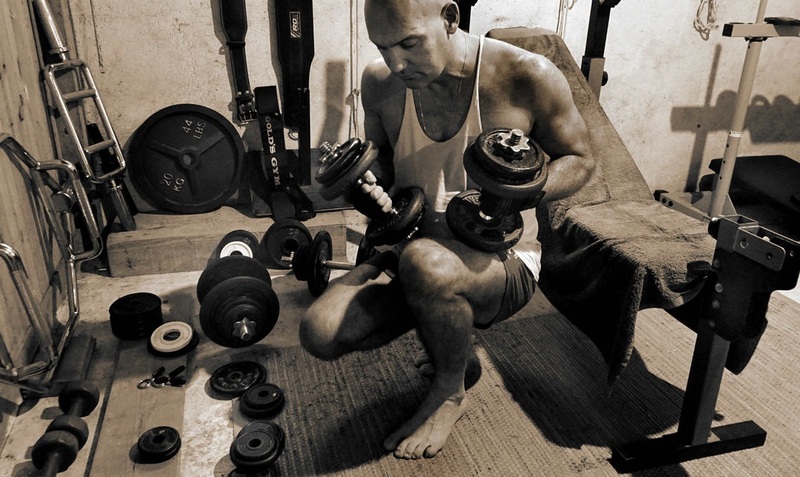 Why should you build a home gym in the first place? Some people love the gym, whilst others love the convenience of their own home. Maybe you don't want to pay gym fees. Maybe you have such as busy lifestyle that quick home workouts are the only thing that works for you. In that case, a home gym setup is certainly a damn good reason for you. Personally, I prefer going to the gym and attending Calisthenics classes, as that's how I stay best motivated and inspired to push myself alongside others. But even then, I think it's important to workout at home in addition to attending classes if I really want to progress with my goals. However you spin it, I think everyone should have a good enough reason to build a home gym. It simply comes down to figuring out what the best setup for you is, with the budget you've got. In this guide, I want to recommend the most efficient setup you can put together, whilst taking your personal budget and space to work with into account. So first you need to ask yourself, what factors are going to affect my equipment choices that may be different to others? You'll want to think about what you're trying to achieve first. If you're just starting out, then maybe you want to begin by purchasing a pull-up bar in order to work on some pull-up fundamentals. If you want to use a home gym in order to drill a specific sub-set of skills and progressions, such as Planche, handstands, and balancing moves, then perhaps you need to get some parralletes. Personally, I work on my strength training and new techniques during Calisthenics classes at my local gym, whereas I use a pair of parralletes in my room to regularly work on my handstand balancing. I think this is one of the biggest differentials most people have to work with, and it's all well and good recommending a load of different equipment, but that's going to be useless advice when it comes to not knowing your space. Person A, for example, may have an empty garage with plenty of wall space to bolt fixtures too. Person B, on the other hand, may only have a small amount of bedroom space to use within a rented house that limits what they can do structurally. It's important you make sure you think about how much space you really have to use, and what you will and will not be able to do with it. OK, so how much should you really be spending on your home setup? The way I like to look at this is to first think about how much value you're going to get out of building a home gym. For example, if you're using it as a gym alternative, then you could be saving around £30 a month in gym fees, which equates to over £350 a year. Put's it in perspective, doesn't it? We don't all have that much to spend though, so my first recommended setup focuses on a cheaper budget. Resistance bands are a total game changer. They can be used both as a resistance to bodyweight exercises and as an assistive aid for harder bodyweight exercises, allowing you to progress easier. They can also be used as part of flexibility training. Read our handy Resistance Band Guide to find the best band(s) for you. I really hate it when you're watching Instagram videos and people have completely torn up calluses on their hands. If you, like me, struggle with poor grip and pain around calluses, then do yourself a favour and grab a simple climbers chalk ball. They only cost a few pounds on Amazon and I've had chalk balls last me well over a year before. Let's strip it down to the absolute basics for the first setup. If I had £30 - £50, what would I buy? Well, to answer that I think we need to look at the fundamentals of a Calisthenics workout. Although you could probably achieve all of the above without any equipment (heck, I used to use the underside of my parent's staircase for pull-ups as a kid! ), I would recommend at the very least you need a doorframe pull-up bar to comfortably work on your pull-ups. On a budget, I recommend the York Fitness Chinning Doorway Pull-up Bar, which you can get for around £15. I'd also recommend a pair of Push-up grips, which you can easily find for under £10. Can't I just do push-ups on the floor? You can yes, but push-up grips force you to use a closed grip when exercising, rather than flat palms on the floor. Mixing between palms flat on the floor and gripping a push-up grip will improve the flexibility and strength of your wrists, along with their general long-term health. They also put some space between you and the floor, which is particularly useful for L-sits and other advanced core exercises which you wouldn't be able to do without being raised from the floor. The following setup is going to set you back between £150 to £300 depending on what you choose, but don't forget, that's still less than a year's gym membership! The foundation of this setup would be either a solid free-standing pull-up bar or a wall-mounted bar. Either way, the key is to find something stable that would accommodate your weight over and above the bar, in order to do muscle-ups and other moves transitioning over the bar. Here I'd recommend the MiraFit Power Rack if you have space, or the Gymcor Commercial Wall Mounted Pull-Up Bar if you don't have that much space, but have a solid wall to fix a bar to. I would then get the most out of the bar by adding a pair of gymnastic rings and a set of resistance bands, both of which can simply be attached to the bar. 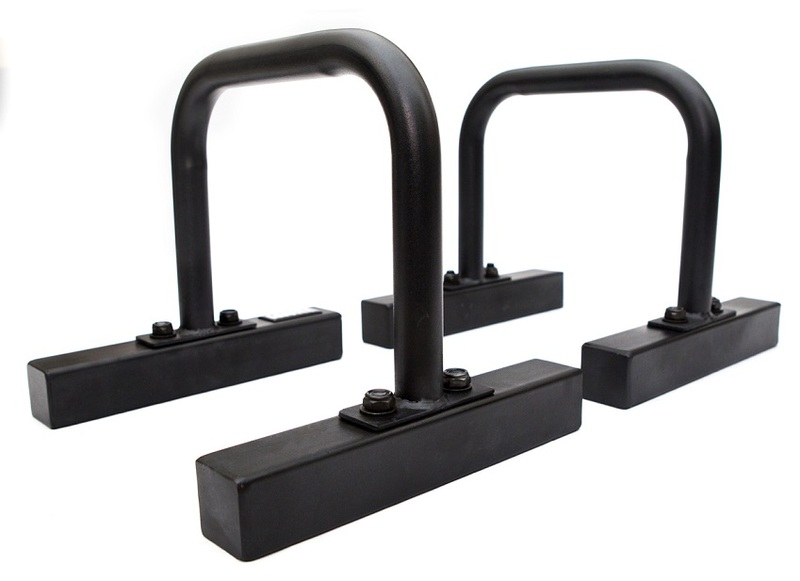 Hang these from the bar to perform various ring based exercises such as push-ups, pelican push-ups and rows. You can also use the rings to work on your false-grip, and even ring muscle-ups if you've mastered the technique. 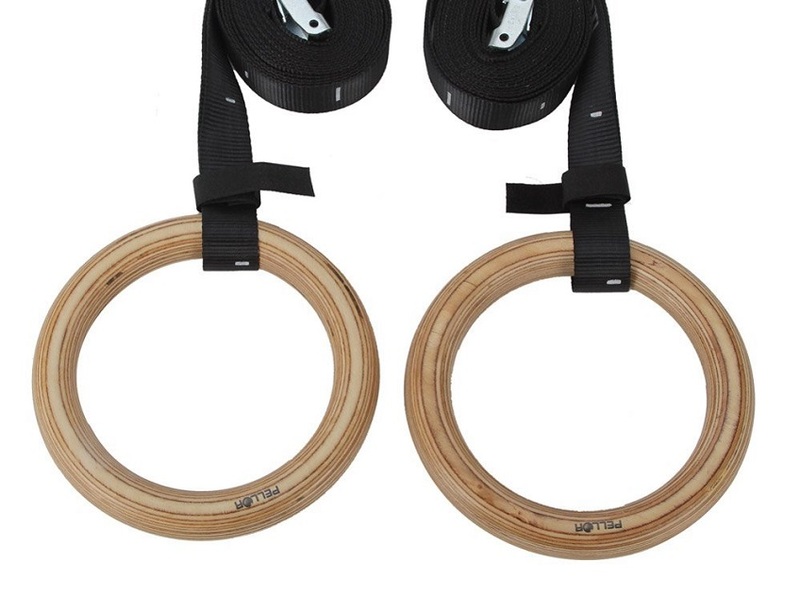 Ideally, a wooden pair of rings is best here, such as the Pellor Olympic Gymnastic Rings, which will set you back just short of £30. Wooden rings feel much better and don't get sweaty on your palms, but a cheaper alternative (£15/£20) won't be a problem; it's down to preference. I've already mentioned resistance bands in this post, but if you're looking for quality then I'm going to take this chance to recommend the Rubberbanditz set (£45). The resistance band world is plagued with cheap rubbish, but the Rubberbanditz set gives you a good mix of different resistances, and can't be beaten on quality. Not only can you use the lighter bands for stretching and flexibility, but the heavier bands can be attached to the bar to help you progress with much harder calisthenics exercises. Check out this post - 10 calisthenics exercises with resistance bands - to get a flavour of what you can do with them. The last piece of equipment I would add to this setup is a pair of Parallettes. Parallettes are great to train L-sits, planche and general balancing exercises. I've owned a pair of Gravity Fitness Parallettes for over 6 months now and they're an excellent choice. You can grab a pair for around £35. If you're smashing out the basic exercises, like pull-ups, dips, and push-ups, then I'd also recommend investing in a weighted vest to help increase resistance. Take a chance to congratulate yourself if you fit into this category! 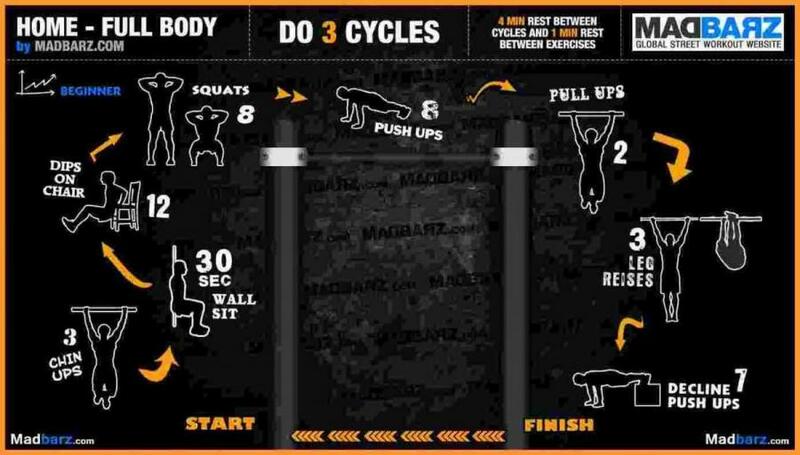 MadBarz offers free workout routines and they have a wealth of great infographic content which you can easily find online. I've already scoured Google Image Search for my favourite routines (which may give you a flavour of my own goals), which I'll share with you below. If you're looking for something different then I'd recommend downloading their app, as they have much, much more content.